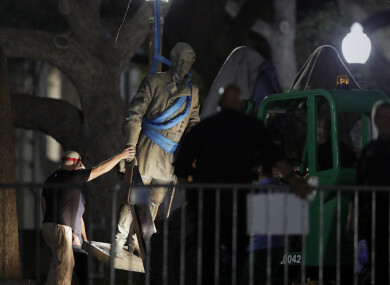 The statues were moved at night for safety reasons, a spokesperson for the University of Texas said. THE UNIVERSITY OF Texas removed Confederate monuments from its Austin campus in an operation that was begun during the night amid a national debate in the US over what to do with Civil War-era symbols. The decision yesterday to remove the monuments came a week after violent protests in Charlottesville, Virginia by white supremacists ignited an uproar over the display of racism. “Confederate monuments have become symbols of modern white supremacy and neo-Nazism,” university president Gregory Fenves wrote in announcing the decision to move the statues to a history museum on campus. Work began overnight to remove the monuments of Confederate figures, including general Robert E Lee, a revered figure for many white southerners but, for others, a symbol of the South’s defence of slavery. The Civil War-era statues commemorate Southern states’ secession from the United States in order to maintain slavery as an institution. “The University of Texas at Austin has a duty to preserve and study history,” Fenves said. But our duty also compels us to acknowledge that those parts of our history that run counter to the university’s core values, the values of our state and the enduring values of our nation do not belong on pedestals. A university spokesman told the New York Times that the statues were moved at night for safety reasons, after the Virginia rally over a statue of Robert E Lee led to the death of a 32-year-old counter-protester. The statues’ preservation in public areas has become a rallying cry for white supremacists. President Donald Trump last week condemned removals of monuments, saying history and culture were “being ripped apart”. Democrats and fellow Republicans have criticised Trump over his response in the aftermath of the white supremacist rally. An estimated 40,000 anti-racism demonstrators flooded Boston on Saturday to counter another rally by far-right groups, prompting Trump to offer a congratulatory message on Twitter. “I want to applaud the many protesters in Boston who are speaking out against bigotry and hate,” he tweeted. Email “Confederate statues removed in dead of night from Texas campus”. Feedback on “Confederate statues removed in dead of night from Texas campus”.